Lord Shiva said “My dear Parvati, now I will relate to you the glories of the Eleventh Chapter of Srimad Bhagavad-gita. 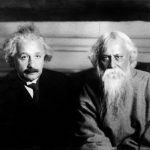 It is not possible to tell it’s full glories, as there are thousands of stories, I will relate one of them only. The villager replied, “In this town one very frightful rakshasa lives, who every day was eating villagers as and when he pleased. One day, we all went to that rakshasa and requested him to protect us, in return for which we would provide him with his daily food. One dharmashala was built, and any travelers who came here were sent there to stay and while they were sleeping the rakshasa would eat them, In this way we have been able to protect ourselves from this rakshasa. You, along with your associates, stayed at that dharmashala, but that rakshasa did not eat you along with everyone else. The reason I will tell you. Last night a friend of my son came but I did not realize that he was a very close and dear friend of my son, so I sent him to stay in dharmashala. 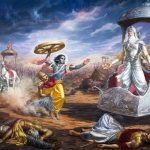 Later when my son found out, he went after him to try and bring him back from the dharmashala but when he went there, he was also eaten by that rakshasa. Today, in the morning, I went to that rakshasa and asked him, why he had eaten my son along with the other travelers. I also requested him, if there was any way, I could get back my son. That rakshasa told me, “I did not know that your son had also entered the dharmashala, thus he was eaten with everyone else. 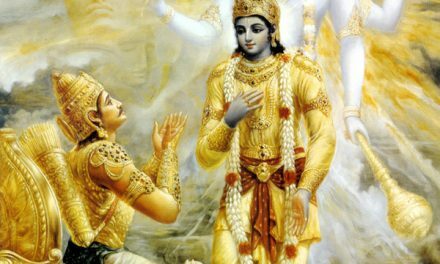 As far as getting him back that will be possible when I am freed from this rakshasa body which will be possible by the mercy of a person who recites the Eleventh Chapter of Srimad Bhagavad-gita daily. 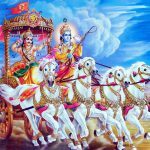 Right now, there is one brahmana staying in this town, who had stayed at this dharmashala, but I had not eaten him, because he daily recites the Eleventh Chapter of Srimad Bhagavad-gita. 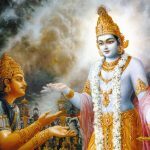 If He daily recites the Eleventh Chapter of Srimad Bhagavad-giia seven times then sprinkles water on me, then I will be able to get free from the curse of this rakshasa body”. Sunanda inquired, from that villager, “What sin did this person perform to attain a rakshasa body?” The villager replied, ‘Long ago there had been a farmer living in this town. One day he was guarding the fields when, just a little distance away from him, one large vulture attacked a person, who was traveling on the road. At that time, one yogi was passing by and when he saw that person being attacked by that vulture he came running to his aid but when he reached him, it was too late. 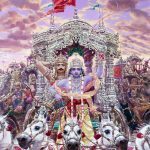 Then that yogi became very angry with the farmer and spoke to him as follows, “One who sees others in danger from thieves, snakes, fire, attack by weapons etc., and even though he is capable of helping them, but does not come to help, is punished by Yamaraja. After suffering in hell for a very long time, he takes birth as a wolf. 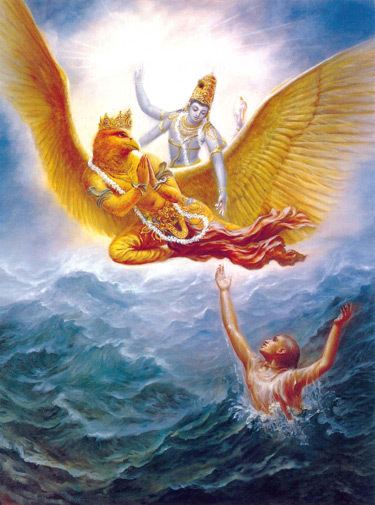 And one, who helps someone in need of help, certainly pleases Lord Vishnu. 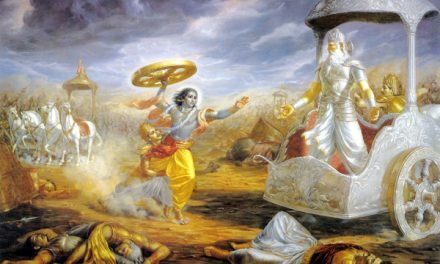 One, who attempts to save a cow from the hands of a ferocious animal, a low-class man or a wicked ruler, attains Lord Vishnu, Wicked farmer, you saw that vulture attacking that person but still you made no attempt to save him. Now I curse you to take birth as a rakshasa.” The Farmer said, “I was watching the fields for the whole night and I am very tired, so kindly be merciful to me, oh, gentle sage.” The yogi replied, “When someone, who is daily reciting the Eleventh Chapter of Srimad Bhagavad-gita, sprinkles water on your head, then you will become free from this curse”. The villager said. 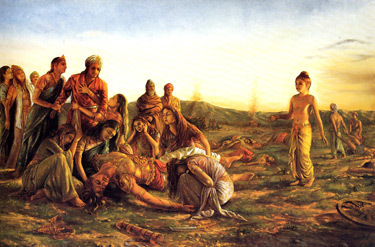 “My dear Sunanda, with your hand kindly sprinkle water on the head of this rakshasa.” After hearing that history from the villager, Sunanda went along with him to the place where that rakshasa was staying and while he was reciting the Eleventh Chapter of Srimad Bhagavad-gita, sprinkled water on his head. That rakshasa immediately attained a four-armed form like that of Lord Vishnu. Not only he, but all the thousands of persons he had eaten also attained a four-armed form like that of Lord Vishnu. Then they all sat down in the flower aeroplane, which had been sent to take them all to Vaikuntha.